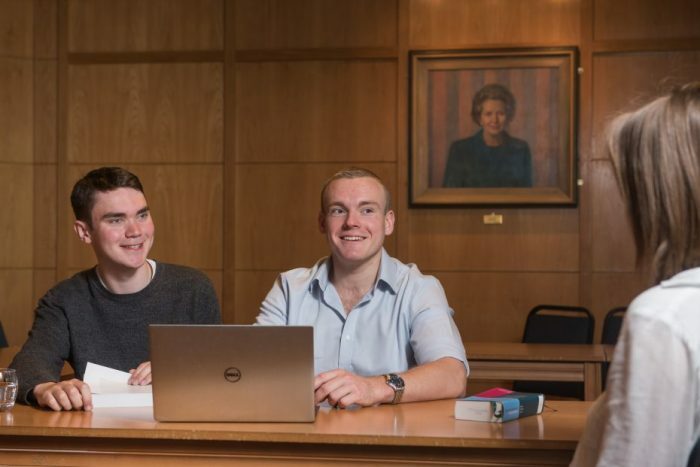 The Margaret Thatcher Scholarship Trust has been established to create fully-funded scholarships which will enable the most promising students to benefit from the unique education and intellectual environment that is offered by Somerville and Oxford. Somerville has fostered generations of young minds with its pioneering spirit, which spurred its students on to extraordinary achievements, and counts Margaret Thatcher among its most illustrious alumni. This is an unprecedented endeavour for an Oxbridge College, both in scale and in scope. The Thatcher Scholarships are open to all, at undergraduate and postgraduate level, regardless of the subject of their course, and without regard to national, cultural or ethnic origin. Scholars are also supported by the Thatcher Development Programme, a new initiative open to all students at Somerville, providing training, access to internships, help with travel to conferences and support for all kinds of career development. The aim of the Trust is to create a living legacy for this famous alumna that grows in stature with each passing year, as it enables some of the brightest minds in the world to come to Oxford as Thatcher Scholars. To be considered for the scholarship, students must first be accepted onto a course by the University of Oxford through the usual admissions process (undergraduate admissions or graduate admissions). To equip them to excel in their chosen field. The Thatcher Scholarships cover 100% of University and college fees (where applicable), and provide a generous grant towards living expenses and travel to Oxford, enabling Thatcher Scholars to graduate free from debt. The scholarships are tenable at Somerville College. The selection timetable for the Scholarships varies for postgraduates and undergraduates, and for undergraduates will also depend on fee status (Home/EU/Islands or International). But in all cases students who meet the high academic standard will automatically be considered for the Scholarships and invited to apply, where appropriate. Applications for the Scholarships should not be submitted to Somerville now. Undergraduates – UK, EU and Islands students will be considered for the Scholarship after their First Public Examinations (for most subjects, these are in the first year). The Scholarship will be extended cover the cost of the initial year(s) retrospectively. Overseas students will be considered for the Thatcher Scholarship once they have been offered a place to study at Oxford at Somerville College. The scholarships are primarily awarded on the basis of academic excellence. For entry in 2018/19, the Ng Teng Fong Thatcher Scholarship will be available to candidates with Overseas fee status, normally resident in Singapore, Hong Kong or China. For entry in 2017/18, all candidates with Overseas fee status were eligible for the Qatar Thatcher Scholarship, for which preference is given to candidates normally resident in Qatar or Arab countries. There will be one Qatar Thatcher Scholar with Overseas fee status at any time; this scholarship opportunity will therefore next be available for entry in 2021/22. For postgraduate courses (Masters and DPhils) commencing in 2018/19, three Thatcher Graduate Scholarships will be available. Two scholarships will be awarded to specific departments, one to the Nuffield Department of Clinical Medicine and one to the Faculty of Modern Languages. Applicants to these departments will be automatically considered for the Scholarship, if they apply by the January deadline for their course. For the third scholarship, the Oxford-Qatar-Thatcher Graduate Scholarship, preference will be given to candidates normally resident in Qatar or Arab Countries accepted onto a post-graduate degree course, which is offered at Somerville College. For entry in 2017/18, scholarships were offered in: the Faculty of English Language and Literature; Department of Engineering Science; and Faculty of Law. Further information can be found at the University of Oxford website.